Even if you put zero value on Ajay Piramal, as the stock market is doing right now, you’d have to agree that he’s beaten the hell out of that insanely crazy market. Since 1988, when he took charge over what is now called Piramal Healthcare, and may soon be called by another name — Ajay Piramal has made his long-term investors not just rich. He’s made them fabulously rich. Consider this: Over the last 23 years, investors in Ajay Piramal’s flagship company have compounded their money at an average annual rate of 28%. In contrast, Sensex compounded at only 17% a year. The difference between compounding money at 17% a year and at 28% a year becomes truly staggering over time. While Rs 100 became Rs 3,700 with Mr. Sensex in 23 years, they became Rs 29,230 with Mr. Piramal instead. Ajay Piramal’s track record becomes even more impressive if one considers that the 28% a year return delivered by him was computed by using the currently undervalued stock price of Piramal Healthcare. As I write this, the company has 20.9 crore shares outstanding selling at Rs 479. By the time you read this, however, the company would have bought back and extinguished 4.2 crore shares (20% of the total) at Rs 600 each. An indication of the price at which the remaining 16.7 crore shares may be valued by the market after the buyback, one can look at the April 2011 futures price now quoting at Rs 450 per share. In effect, post buyback, the stock market is valuing Piramal Healthcare at about Rs 7,500 cr. When Ajay Piramal bought Nicholas Laboratories from its foreign parent in 1988, the company’s market value was only Rs 6 cr. This launch pad into the drug space enabled him to ride on the wave of huge subsequent growth of the Indian pharma industry. After several brilliant acquisitions, mergers, spinoffs, and other corporate restructuring transactions orchestrated by him over the next 23 years, the company morphed into what became known as Piramal Healthcare. Then, in May 2010, he stunned the business world by announcing that he has sold part of Piramal Healthcare’s business, constituting about half the company’s revenues, for a staggering $3.8 billion, or about Rs 17,140 crores, to Abbott Labs of USA. Two months later, he sold the company’s diagnostic business to Super Religare for Rs 600 crores. These two deals, having an aggregate value of Rs 17,740 crores delivered an upfront cash of about Rs 10,200 crores to the company. The balance Rs 7,540 crores — almost all of it due from Abbott — would be received over the next 42 months. Having an insignificant credit risk, these future receipts, which are not conditional upon the achievement of any milestones, have an estimated present value of Rs 6,300 crores, assuming a discount rate of 10% a year. The value of cash already received (Rs 10,200 crores) plus the present value of receivables (Rs 6,300 crores) comes to Rs 16,500 crores. From this, if we deduct taxes paid amounting to Rs 3,700 crores on the huge profits made on these disposals, Rs 2,500 crores utilized for the buyback, debt of Rs 793 crores, and two minor items relating to the payment of a non-compete fee and charity, we are left with net cash and cash equivalents of about Rs 8,700 crores as of now. On a per share basis (post buyback), this comes to Rs 517.This is the number I want you to focus on because it exceeds the stock price of Rs 450 per share. If Piramal Healthcare were to be liquidated today for just the cash and its equivalents, with no value received from the sale of its three operating businesses which Ajay Piramal decided not to sell, the stockholders would get about Rs 517 per share. The stock market, it its own “wisdom,” is valuing the whole company at Rs 450 per share. In other words, if you were to believe the stock market, this company is worth more dead than alive. For long-term investors, however, this is a great opportunity to partner with one of India’s great wealth creators on very favorable terms. Given that the current market value of the company is less than cash assets alone, the stock market is putting no value at all on the three operating businesses which appear on its balance sheet. Then, of course, there is Ajay Piramal, who does not appear on the company’s balance sheet but, nevertheless, is its most important asset. He comes free too. How often do you get a combination of: (1) a company with a large market capitalization; (2) cash in excess of its market value; (3) other assets having substantial future value; and (4) a brilliant and ethical owner-manager who has a demonstrated track record of enormous wealth creation for his long-term partners? Not very often, in fact, its very rare. Ajay Piramal is a rare occurrence and his story is worth telling you about. But the real story of the man is not just about how remarkably he sold the formulations business to Abbott. Nor is it only about the numerous smart acquisitions he has done although that has grabbed most of the media’s attention over the years. Ajay Piramal’s story is also about a man who has a contrarian bend of mind, who ceaselessly explores multiple ways of creating value, and who has a very long-term orientation about wealth creation. Take a look at the following table, taken from a presentation available from the company’s website. The stunning growth depicted in the table is the result of both organic and inorganic growth. That’s another very rare combination. Being successful in M&A transactions is rare enough (about 70% of acquisitions fail to create value). Being successful in M&A and in operating several businesses in multiple countries is very rare indeed. One test of long-term managerial performance I use, and which is favored by Warren Buffett, is an “earnings-retention test.” The test measures how every rupee earned, and not paid out as dividends, by a company gets reflected in incremental market value over a five—year rolling period basis. For companies that destroy value, every rupee of earnings retained is, over the long run, expected to translate into less than one rupee of incremental market value. For value creators, the equation is opposite. Every rupee retained should become much more than one rupee of incremental market value. Going back to 1990, I applied this test to Ajay Piramal’s flagship company. Even if we ignore that the company’s stock is undervalued (which severely penalizes the results of this test), here is the report card: From 1990 to date: 5.8 times (that is, every Rupee 1 retained became Rs 5.80 in incremental market value); From 1995 to date: 5.5 times; From 2000 to date: 5.1 times; and From 2005 to date: 4.7 times. Any way you look at it, Piramal Healthcare has been a consistent wealth creating machine, one which has been only partially recognized by the stock market. Had the market given full value to the cash, the three operating businesses, and Ajay Piramal at the company’s helm, the above results would look even more impressive. Even with one hand tied behind his back, Ajay Piramal has been a champion jockey. Why, then, is the market treating him like an also-ran? To find out the answer to that question, and many others, I met Ajay Piramal at his office in Mumbai last August. I met him again today (25 March). Before meeting him, I studied every acquisition done by him since 1988 including Nicholas Laboratories in 1988, Roche Products in 1993, Boehringer Mannhiem in 1996, Hoechst Research Center in 1998, Rhone Poulenc in 2000, and ICI Pharma in 2002. As I went through each of these deals, and as I studied his track record of managing the business over 23 years, a pattern emerged. In deal after deal, it emerged that Ajay Piramal is a contrarian. Over and over again, he seems to watch what the crowd is doing, and then he goes and does the exact opposite. Back in 1990s, when MNC pharma were participating in a kind of a “Quit India Movement,” Ajay Piramal bought them out one by one at distressed prices. Now, when MNC pharma is desperate to be a part of the “Indian pharma growth story,” he has sold out to Abbott. His vision to expand the formulations business which focused on India, while other Indian pharma companies were focusing on exporting generics to the west, was another superb contrarian decision. 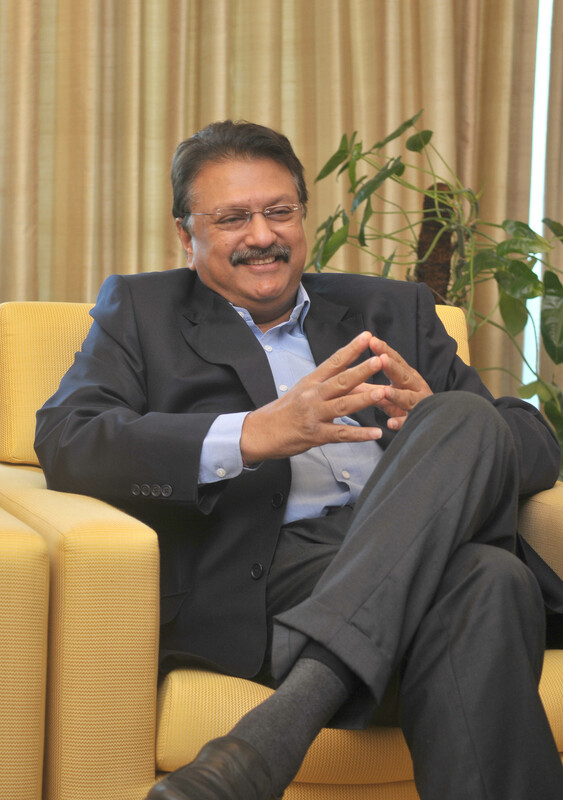 Ajay Piramal enjoys taking the road less travelled by. And it certainly has made all the difference. Another pattern that emerges is that like any good value investor, he simply does not overpay for assets and he often finds value where there is a distressed seller. When I asked Ajay Piramal about his acquisition strategy, he listed his three acquisition principles. One metric commonly used in the pharma M&A deals is price-to-revenue. 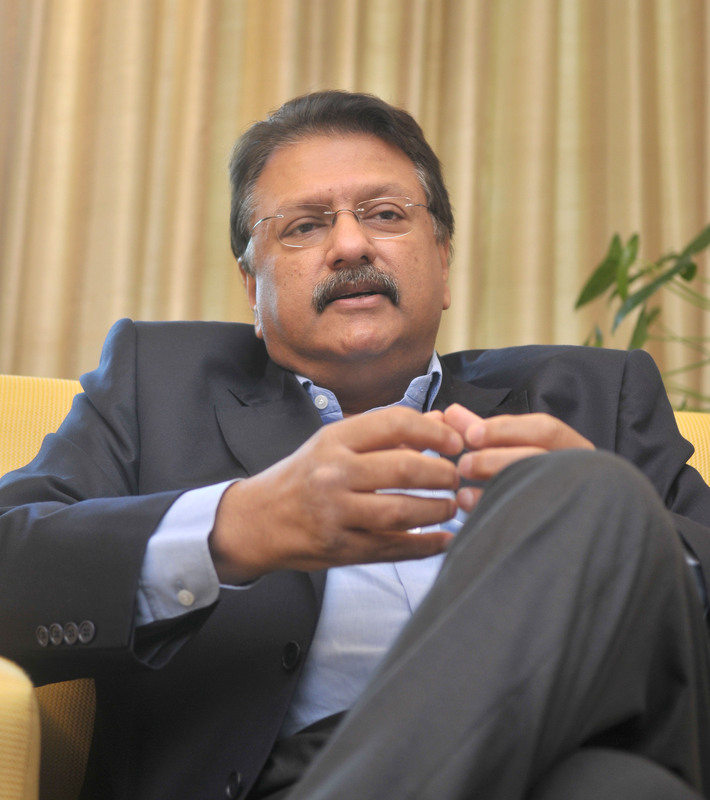 The highest Ajay Piramal ever paid was 3 times revenues for ipill, the popular oral contraceptive brand he bought from Cipla in March 2010). More typically, he paid less than one times revenue for most of his acquisitions. When it came to the sale of formulations business to Abbott, however, he was able to obtain a stunningly rich price of 9 times revenues. In contrast, Ranbaxy sold out to Daiichi in June 2008 for 5 times revenues. Indeed, the sale of the formulations business to Abbott, is one of the most richly-priced pharma deals ever. A big part of the reason why he got such a rich price, is to do with a “seamless web of deserved trust” Piramal has created with big pharma over the years. When I mentioned this idea to him — an idea that was first articulated by Charlie Munger, Warren Buffett’s partner — he smiled at me. He knew what I was getting at. After all, Ajay Piramal is a Buffett and Munger fan and often goes to attend Berkshire Hathaway meetings in Omaha. Now that we were warming up, Piramal wanted to tell me more about the creation of his own “seamless web of deserved trust” over 23 years. “Why did we get this valuation from Abbott? It is because of this trust. Seeing what other transactions in the environment before us (he is talking about Ranbaxy—Daiichi deal), they could have gotten another asset at much lower price. So why did they come to us? Because there was this level of trust and understanding. 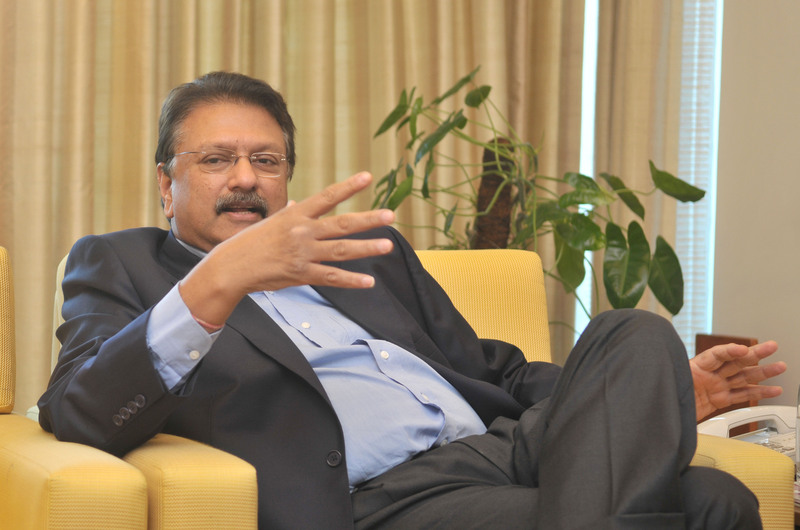 Ajay Piramal wants you to know that by refraining from fighting big MNC pharma companies on their turf (as many Indian pharma companies have done), he was able to get a much better value for the formulations business from them on his turf. Can this advantage be replicated? I think so. How could it be otherwise? Take for example the CRAMS business about which he is optimistic and has a long term vision. This is a small business at present but Piramal expects it to grow. Pfizer (the world’s largest drug company) is a customer of Piramal Healthcare in its customs manufacturing business.The act of letting someone else handle your intellectual property by big innovative pharma companies, requires a very high degree of trust in the manufacturing partner. By leveraging his web of trust, Piramal expects to become a “partner of choice” for big pharma companies. Of course this requires a very long term vision, which is another element of the pattern that emerges by studying his track record. For instance, he decided to go into drug discovery business very early. This business requires very long term thinking, ability to take risks, and to be prepared for failures, for the success rate is very low. Moreover, there is hardly any earnings visibility — something that most analysts abhor. But if you get lucky, then the sky is the limit. If you step back a bit and see what is happening to the big pharma companies in USA and Europe, you will see that there is this big wave coming. Its a wave of shift of innovation from west to the east. Its a small wave right now. But Ajay Piramal can see it becoming a tidal wave in a few years. Through Piramal Life (the unit was spun off from Piramal healthcare in 2007), Ajay Piramal has positioned himself just ahead of this approaching tidal wave. Shakespeare, who wrote “There is a tide in the affairs of men, which taken at the flood, leads on to fortune,” would have approved. A big part of Ajay Piramal’s grand strategy is to retain Piramal Life. But why did he spin it off in the first place and what will he do with it now? He tells me that Piramal Life was spun off from Piramal Healthcare in 2007 because it had a very different risk profile. By its very nature, the drug discovery business is a highly speculative business. Mixing it with the formulations business did not make sense, hence the spin off. To many, Piramal Life’s spin off may have appeared as an attempt to correct a past mistake of going into the drug discovery business in the first place. After all, spin offs are often used to get rid of troublesome businesses created by overoptimistic and overconfident men. This, most definitely, was not the case here. Both Ajay Piramal, as well as his highly qualified and accomplished spouse, Swati Piramal, who runs the company, are very optimistic about the long—term potential for the drug discovery business in India. In many ways, their contrarian traits can be seen from the way Piramal Life has been managed. For example, if you run a drug discovery company, one way to de-risk the business is to out-license your molecules to a big, and more prosperous pharma company who will then put its financial, technical, and political strength behind its development and approval by regulators such as the FDA. Of course, they would do that in return for a big part of the upside. This is how drug discovery model has worked for decades. Well, that’s not how contrarians Swati and Ajay would like to make it work for them. Piramal Life has 14 molecules under development, and has no intention, (at least, as of now) to out—license any of those molecules. The reason is simple: They don’t want to give away the upside. If they decide to out-license now, I won’t be surprised that they would be able to negotiate and obtain upfront, and subsequent payments several times the current market value of the company (current market cap at Rs 108 per share is Rs 274 crores). But that is not how they think. They think in terms of not years, but decades. They think in terms of not maximizing near term reported earnings, but maximizing eventual net worth. Both of them share a dream of leading the first Indian company which goes from discovery of a molecule to the global launch of a drug. Can they do it? Let me ask you the question another way. Given the resources — technical, human, financial, and their excellent relationships with big pharma — they now have, is there anyone else in India who can do it? And if they do it, can you imagine the financial consequences? Sometimes in life, exposure to low—probability—high—positive—impact situations (positive black swans) can massively improve the financial results of that lifetime if you get lucky, for you only have to get lucky once in a big way to make it worth your while. And the best way to get lucky is to organize for good luck to come to you. Louis Pasteur was right when he wrote: “Luck favors the prepared mind.” The minds of Swati and Ajay Piramal are prepared and they have positioned Piramal Life to have a chance for the “best shot at the goal” in the drug discovery business. There are two more interesting aspects about Piramal Life worth noting here. One, the company has negligible revenues, is highly leveraged (at least when measured against debt service ratios), and has large accumulated losses. Typically, this implies a large bankruptcy risk. However, the way I see it, the day Piramal Healthcare sold the formulations business to Abbott, the bankruptcy risk in Piramal Life disappeared because a very rich, committed, and long—term oriented parent now stood behind it. Two, the large accumulated losses in Piramal Life alone would be quite useful to highly profitable and tax paying Piramal Healthcare. That’s because in a merger, they could be used as a tax shield. Back-of-the-envelope calculations show that these accumulated losses alone, are worth about Rs 60 per Piramal Life share, to Piramal Healthcare. For these strategic and financial reasons, it makes imminent sense for Piramal Life to return to its very rich parent although there is no certainty by which this would happen. Another part of Ajay Piramal’s grand strategy is to expand the three businesses that he did not sell. These are Custom Research and Manufacturing (CRAMS), Critical Care, and Over-the-counter (OTC) business. These businesses are small right now, but should grow in size as well as profitability over the next few years. Keep in mind that the growth-oriented Piramal is always on the lookout of cheap inorganic growth and it wouldn’t surprise me if he made a few very smart acquisitions in these businesses over the next few years. The key thing, when you have cash, is to also have discipline. Famous fund manager Peter Lynch once wrote about the “bladder theory of corporate finance,” according to which the more the cash that builds up in the treasury, the more the pressure to piss it away. While this principle is largely followed by many companies and men who have suddenly come into cash, is it likely that Ajay Piramal is such a man? I doubt it very much. His track record of demonstrated discipline in acquisitions speaks for itself. And recently, when Paras Pharma was being auctioned, while he had an interest in acquiring the company, he walked away because the asking price was too high. He agrees with Warren Buffett, who once said that the smarter side to take in a bidding war is often the losing side. The key thing to remember here is that, given the current market value of the company, all of these businesses come free to the buyer of the stock at the current price. These include some of the most well recognized brands in the OTC business including ipill, Lacto Calamine, and Saridon. Well, if you own the stock at the current price, then among many other OTC products, ipill, Lacto Calamine, and Saridon come free (the brands, not the pills or the lotion). Since the sale to Abbott, the media has been chasing Ajay Piramal about his plans for the cash. In response, he has consistently said three things. One, he will reward shareholders. This is already done through the buyback. Two, he will expand the remaining three businesses he did not sell. And three, he will diversify into one or more new businesses. This last statement has spooked the markets. Anytime a company announces a plan to diversify into a new business, the markets tend to dislike it. Usually the market is correct in this assessment because companies do tend to waste cash through diversification. However, my view is that you cannot paint everyone with the same brush. Just as the market’s skepticism for Ajay Pirmal’s grand strategy of growth though acquisitions was wrong, its skepticism for his decision to diversify is also likely to be wrong. The market forgets that his original decision to move into the pharma business in 1988 was also a decision to diversify away from the textile business. Nevertheless, the investment community is skeptical about what he will do with the money. Will he go into real estate? (He has denied this.) How about insurance? Or Retail? My question about this is: Does it matter? Should one not focus on the man’s track record of wealth creation instead of worrying about whether he will go into real estate? And if he does go into real estate business, so what? Of all the people in India, he has one of the best experiences in the business. He was behind Peninsula Land, he was behind India REIT, he was behind India’s first retail mall (Crossroads) and he is behind Sunteck Realty. Indeed, if Ajay Piramal were to announce that he will diversify into real estate, investors should rejoice for two reasons. One, the man has experience and track record of having done exceptionally well in that space. Two, the space is full of opportunities where he can create value by buying into distressed situations prevalent in the real estate space at present. Then there is talk about his acquiring Hindustan Dorr—Oliver. So I asked him, not whether he would diversify into the real estate business in Piramal Healthcare, or whether he is going to buy Hindustan Dorr—Oliver. Instead, I asked him, what are the things he seeks when he wants to buy into a new business. He simply repeated his three acquisition principles mentioned earlier. How consistent! He did, however, mention, that he would expand overseas in both related, as well as unrelated ares. One of the paradoxes about Ajay Piramal is that while he has a disdain for elaborate excel models of DCF valuation taught at business schools, it is the very same DCF (or rather the absence of the possibility of using it) which is a key reason for the street’s neglect for the stock. So here is the paradox: Ajay Piramal has not made his money by relying on elaborate DCF modeling. On the other hand, sell-side analysts and many investment professionals make their living by DCF modeling. Pick virtually any research report on any stock and turn to the pages in the end and you will see what I mean. There will be projections about the future (many of which will turn out to be wrong), based on which there will projections of future cash flows, which would have been brought back to present value using more projections about cost of capital. This “false precision” is yet another form of “physics envy,” practiced by men (mostly) who forget that its better to be roughly right, than to be precisely wrong. After several failures, the analyst gives up. My advice to the analyst is that he needs another tool, one which he will find if he reads the influential paper “Investing in the Unknown and the Unknowable (http://www.hks.harvard.edu/fs/rzeckhau/unknown_unknowable_PUP.pdf), by Harvard Professor and a, much admired by Charlie Munger, champion bridge player, Richard Zeckhauser. The World of uU investing. “Risk,” advices Warren Buffett, should be thought of as the probability of permanent loss of capital. While most uncertain situations are also risky (e.g. new startup ventures), this doesn’t mean that every uncertain situation is also risky. I ask you to carefully think about this. Given what you now know about Ajay Piramal, given his past track record, and given the asking price for becoming his partner (free), how likely is it that if you do become his partner, and if you have a long—term view, you will suffer a permanent loss of capital? While the street steers clear from Piramal Healthcare, India’s largest cash bargain, because “the outlook is uncertain and there is no clear visibility and that makes it too risky” does that have to mean that you should steer clear too? That’s a question I will leave for you to answer. As for me, I have to tell you that I own shares in Piramal Healthcare, and I have to tell you that Ajay Piramal bought shares in the company in November 2010 at around Rs 460 per share, and that the company has just completed a buyback at Rs 600 per share. The stock is selling for 450. The cash per share is 517. Everything else is free. The author is a Professor at MDI, Gurgaon where he teaches Behavioral Finance and Business Valuation. A condensed version of this post, will appear in the forthcoming issue of Outlook Profit. as usual..just like previous posts and BFBV classes this post gives a completely new perspective ..thanks for this..
Just had a couple of questions..
2 – Is it more likely that the cash will be deployed in continuing pharma businesses ( including acquisition) or a completely new business? Thanks again for BFBV and your posts..
2. In my view, he will deploy the cash in profitable assets (in pharma and in other spaces) over a period of time, depending on where he finds relative value. Keep in mind that a big part of the sale consideration (on which full tax has already been paid), will come over the next 42 months. So, you have to be patient about how the capital is deployed over that time period. a) The public had invested money in business of NP and have not put money on Ajay Piramal ( I am not saying that shareholders were not rewarded but many companies have). b) If Ajay Piramal thought of selling the company because it was overpriced, He could have sold his stake and the people who would have wanted to exit the business would have sold it in open offer. c) If at all if is doing in the interest of all shareholders, he should have declared a bumper dividend and returned most of the money. d) But he opted to bring in a buyback only to the tune of 20% of the Capital , wherein he is also participating, effectively only 9% of minority shareholder would be able to sell its shares, where as If the there would have been open offer, at least 20 % of non promoters shares would have been sold. If fact he is also tendering his shares indicating that he is not ready to leave anything on table for non promoter shareholders. e) if a very renowned guy comes to us and ask us to give money for a new business venture and without asking about the details of venture. Do you think will we will put money in him, if he is not ready to divulge his business plans, its feasibility and its profitability etc? This is the case with NP, he is keeping money and suggest us that he will employ the money. If the monies are returned and then If ever he has a business plan later he can come with IPO and i am sure if there is potential People will put in the money. f) NP came out with buyback and not special dividend, the reason was that such buybacks are more TAX efficient , but it should be read as (Tax efficient for promoters) . Before the announcement of Buyback there were many bulk deals reported on exchange among promoters, this is where the transfers were done for effective tax planning, where other investors were not privy to. g) Sir there are many companies who have cash more than its market cap (Though second line stock BRFL, Bombay oxygen) There are holding companies whose price is much lesser than it SOTP (mainly for holding companies). Unless the values of such companies are unlocked they will be traded at discount and the same is true for NP, the cash in the company is lying idle and unless they are employed or returned they are in the hands of promoters and at their disposal. h) The better corporate governance should be that the money be returned to shareholders and let them decide, which business they want to invest in. i) Lastly there are few case in Indian corporates where the business are sold by promoters and the monies are at their disposal SEBI should come up with some guideline on such situations. It’s the difference of opinions which make stock prices. If everyone agreed, there won’t be any stock market quotations. 1. Ajay Piramal did give a dividend of about Rs 120 per share. Merely because its called a “buyback” does not change the economic reality of a dividend. When a company distributes cash to its stockholders, and after such a distribution, the proportionate ownership of stockholders does not change (even though the number of shares held by any given stockholder may change), then such a transaction is functionally equivalent to a dividend. Through proportionate tendering, he ensured that he has created a “dividend” without actually it being defined as “dividend” in legal terms. 2. Of the Rs 10,200 crores received, about Rs 5,000 crores went in taxes (Rs 3,700 crores), and other items like non-compete, charity, and debt reduction. Of the balance, Rs 5,200 cr, about Rs 2,500 has been returned by way of “dividend” as described above. So, a big part of the cash in hand has been distributed to the stockholders. Most of the cash and cash equivalents of Rs 517 per share, constitute receivables (mostly from Abbott), to be received over the next 42 months. The value of this receivable on a per share basis is Rs 374 per share. 3. The structuring the transaction with Abbott as a sale of the business, instead of sale of shares, can be viewed differently. I believe your skepticism arises from observation of other deals where a similar structure was used, which is fine. Had, the deal been structured as a sale of shares, however, while the promoters would have been better off because they would pay no tax on such sale, not all the minority shareholders would have benefitted as under the current takeover regulations, the size of the tender offer would have been for only 20% of equity. Moreover, Ajay Piramal is not retiring from the crease. Rather, he is entering into his second innings. Structuring the transaction as a sale of the business, gives him that opportunity to replicate what he has done in the last 23 years. I know, this can be, and in fact, has been, interpreted differently, but then, these are my views. 4. While there are other companies which sell below cash, and there are holding companies which sell much below their liquidation values, their past track record, as measured by market recognition of earnings retention )which I wrote about in my post) is not good. In the case of the holding companies, the situation is worse because there is almost no dividend, and almost no prospect of asset distribution, or their conversion into attractive operating businesses. In case of Piramal Healthcare, the cash is likely to be a temporary asset and is likely to be converted into cash generating businesses over time. In my view, the single most important factor to consider is the past track record of the manager in charge. How did he deploy capital, and how did the market’s respond to such deployment? In both these tests, Ajay Piramal scored high (even if the second test severely handicapped him because of low valuation). My answer is yes, provided I could partner with him on very favorable terms – like the ones I described in my post. Thank you Sir for sparing your precious time to comment, I am not against NP but my concern is we should let investors decide as to which business he should be invested in. b) Management's shareholder friendliness has been questioned logically by Jigam. What are your views on the same? b) Your articles are always learnings for me and others (as you always test the idea and then tell the world- Hey! This worked), but this article is having a bit of Stock Tip attached to it. Any particular reason for publishing this idea 2-3 years before the actual due date? Jatin, since interest on cash will always be less than WACC, should cash always be valued at less than its face value? I think not. I did this piece before 2-3 years of the “actual due date” precisely because of its long gestation cycle. Short term traders are likely to be disappointed in this stock. I was also intrigued by the large inefficiency in valuation, and also about the possible rationalizations given by the street for it. I also wanted to use this case to illustrate the difference between uncertainty and risk. Time will tell if I was right. I ask for 3 years please. 1. What is your source of the balance sheet figures? The publicly available synopsis of the September 2010 balance sheet yields slightly different figures then the ones you have enumerated in your above calculation of cash asset value (especially for the liabilities). And haven’t you deducted current liabilities to arrive at the cash asset value? 2. At various times since the buyback has been announced, the company has been available at a price that would make it a good investment as part of a diversified portfolio on the basis of its current quantitative exhibit (and after factoring accelerated return available from the partial acceptance of shares in the buyback at Rs 600). Thus at those prices, the quantitative value elements in the picture alone were enough to qualify it as a bargain security with a margin of safety. In light of this, what advantage does a deep analysis and emphasis on the qualitative factor of management additionally bring to the table? Is it so that you can make a more concentrated bet on the investment then you could have otherwise done were it more of a quantitative bargain? Or is it because it permits a higher price at which you consider selling the shares? P.S: When I use the terms ‘quantitative’ and ‘qualitative’, I mean the relative weight assigned to the each of those factors in the situation, and not to the consideration of one group of factors to the exclusion of the other group. Ergo, even a quantitative investment would require some basic amount of qualitative considerations. Taha, I got the cash and cash equivalent estimates by doing basic calculations of the two sale transactions done by the company. The tax and other cash outflow items are available in the concall transcripts of the company. My estimate of Rs 517 per share for cash and cash equivalents is conservative because (1) ignored the interest income on the cash; and (2) I used a discount rate of 10% for valuing the receivable. Point (2) is quite interesting actually. What’s the right discount rate to use to bring back to present value, future cash inflows from Abbott? What is this receivable anyway? Is it not the functional equivalent of a bond issued by Abbott? And if so, what is the interest rate at which Abbott can borrow money? And if Ajay Piramal so chooses, can he not sell the claim on Abbott to some hedge fund in USA at an yield to maturity slightly higher then Abbott’s borrowing costs in USA, which are MUCH lower than 10% p.a.? So, it can easily be rationally argued that the receivable should be valued by using a lower discount rate than 10% I used. In fact, if you think about it, since the deferred payments from Abbott are going to be tax free, as the tax on the entire sale has been paid, then even if we use Indian interest rates, the correct rate for discounting the income stream should be the post tax rate of 6.5% and not 10%, as I have done. If we use 6.5% discount rate, then the estimate of cash per share will rise from Rs 517 per share to Rs 540 per share. I did not net off the current liabilities because they pertain to the three operating businesses. In my mind, the correct way to think about this company is to value the cash on the books, the receivable, and the three businesses. The quality of the management factor is very important because its the same man with the same ethos and same operating principles. You really cannot ignore the past track record of the man here, in my view. The reason why its important is that you are getting those qualitative factors – those long term relationships with big pharma for instance built on the trust factor, along with many other things (brands and businesses), for free. Valuation is not just about what you see on a balance sheet. So very often what you see is not worth its stated value. What you don’t see is sometimes even more important – in both a positive and negative sense. For instance, there may be large contingent liabilities which don’t appear on a balance sheet but have a very large bearing on valuation. On the other hand, an asset manager who has created very large amounts of wealth over time does not appear on the balance sheet. If you follow the Graham-and-Dodd here, you will see very little upside. If you look at the big picture (which I tried to describe in my post) and think of the optionality of the cash in the hands of the right kind of guy in the right kind of environment (where assets in the hands of distressed owners are cheap), you might see a much larger upside…. Prof., in that case, how would you put a number to that? Which is something that one would have to do when it comes to deciding on a selling price. Taha, I don’t have to put a number on it right now. Margin of safety in’t always about the difference between a pre-calculated value and price. Rather, margin of safety often means assurance that value is more than price, without actually knowing what that value might be, and that the value is likely to grow. I don’t have a selling price for this stock in my mind at this time. This may change over a period of time. In such cases where u don’t have an approximate selling price in mind, how do you decide whether to tender your shares in the buy back or not? or do u feel that its value is well above Rs600 per share that was offered? Lokesh, when one does not know the value of an asset but has confidence that the value is more than price paid, and moreover, potential future value (assuming that past track record of capital allocation is a good guide to the future) is a lot more than the price paid, then one does not need an absolute price target to sell the stock. One merely has to wait for the value to emerge over a period of time, and once that happens, then one can compare that particular investment with others which may be available at the same time to decide whether or not to switch. Also, the decision under the buyback was obvious because it was more of a dividend than a buyback and investors who did not tender would have lost out by not tendering their shares – yes there were a few of those… The decision to tender one shares under the “buyback” could also be rationally thought of as an exercise to reduce the net cash cost of the remaining shares which were not going to be accepted in the tender. This is great analysis. Huge margin of safety. Proven & Value driven Manager. DCF is not the only method to value a business. Getting Rs 1 (Cash) at less than Rs 1 is a bargain…. Just based on cash valuation it is a great buy…..Margin of safety is the rest of the business. Great find and thanks for sharing. I have one question though. And this comes from one of Warren Buffett’s philosophy – What happens if the business manager gets hit by a truck? Could you throw some light, god forbid, if this event happens…what happens then? Ajay Piramal has a history of creating value with retained cash, but what is the guarantee that others would not fritter it away? Are we still with good economics run by say a half-intelligent Ajay Piramal guy? No matter how well selected an investment may be, there is always a scenario that would produce losses. 2) I have this nagging concern about artificial cash bargain ever since I learned this from you..
Vishnu, I had already factored in the charity amount while estimating cash. This is mentioned in my post. 5) Upside is very limited..because in white motors cases value of “Everything else is Free” comes around 79% of Book value…In artificial Bargains case , value of “Everything else is Free” will be very less compared to the book value…. The deal’s been done almost an year back yet the company continues to hold on to the cash (except for the partial buyback). In that case, it seems unlikely that they intend to return a large part to shareholders and the only other alternative would be to invest in new ventures, related businesses, etc. Logical forward steps would be healthcare, hospitals, etc. In that case, one is looking at the cash being tied in for 3-4 years before something meaningful can come out of it. The new business too would have value, but how much can be answered only later. Fortis for example turned just about profitable only last year (I think after the wockhardt buy). The other idea that I understand from the article they back is molecules. Here again, the record of Indian pharma companies is nothing to write home about. Borrowing from what you said- Both of them share a dream of leading the first Indian company which goes from discovery of a molecule to the global launch of a drug. Can they do it? Here, can one man’s dream override shareholder interest. Also, say he buys out some early stage molecules from other research firms and things don’t exactly work out. Further, apart from the financial muscle, it’s also about the ability to influence the US FDA that would have a bearing on the outcome of the approvals needed. (I am not sure about this but I think one of the reasons Ranbaxy’s promoters sold out was because of the constant run -ins they had with the USFDA following development of their cholesterol drug, courtesy one of the largest pharma co). Further, I am reminded of the corporate governance case study presentation on your website. He has a Stanford educated daughter and a son completing his MBA from Harvard. The former I think is already an exec director and is barely 30. There’s another risk here- this time you may not be investing in Ajay Piramal, but his children, who may not be value investors like their father. The basic premise of my argument is that while there is cash on the books, it is unlikely to come to shareholders in that form. So as an investor, can I value the cash on the books at absolute value or do I look at where the cash goes and then look at the merits of those businesses. Akshay, thanks for writing. Yes I agree with you the value of whatever Ajay Piramal invests in will be known much later. Isn’t that true for all capital allocation decisions? You write : “Can one man’s dream override shareholder interest.” Well, the way I see it, all stock market investments, are an opportunity to participate in dreams, aspirations, ambitions of the promoters. If Ratan Tata wants to make the world’s cheapest car – well thats a dream – one in which every potential investor can participate by buying the stock of Tata Motors (or preferably its DVR). Likewise, if Ajay and Swati Piramal have a dream of leading the first Indian company to move a molecule to a global drug, every potential investor has a chance to participate in it too by buying the shares of Piramal Life. So, in a sense, when a promoter is laying out cash of the company he has promoted into any project, he is pursuing his dream. Potential investors also have the option to not participate in that dream by refusing to buy that stock. But whenever they buy another stock, they are, in effect, participating in a dream of the promoter. Please take a look at this video – http://www.ted.com/talks/r_a_mashelkar_breakthrough_designs_for_ultra_low_cost_products.html – which talks about frugal innovation in India. Then compare the cost of developing a drug overseas and how much money Piramal Life has spent on its 14 molecules till date. Ranbaxy did not have a “seamless web of trust” that Ajay Piramal has – who never challenged other people’s patents. He has gained this trust over 23 years. If I am right, we will see how this web of trust plays out, when its time for Piramal Life’s drug approval application comes up for consideration at FDA. As for your reference to his children, its too early to say if they will have the skill (and luck) of their father. Both of them do have the right credentials though. And how can we know if there was someone else instead of the children, then those people would have better skill and luck than Ajay Piramal? Inclusion of one children in one’s business should not be held against the parents, unless there is evidence supporting that. So, in my view, both the children will have to prove their value to the company over the next few years. We should wish them luck, for they do have a great teacher in their father. All of the risks you have mentioned are there. I don’t know of something that’s risk less. But does the presence of these risks make this company worth more dead than alive? The Piramal Healthcare situation reminds me of one in which I was involved many years ago, back in 2001. Simone Tata has just sold Lakme brands to Hindustan Levers and had all this cash. Then she renamed the company as Trent and decided to go into the retail business and started Westside. The stock fell to Rs 70 – less than cash on the books. The story was the same. A promoter has sold the business, kept the cash, and going into a new business about which there was no visibility. So there was this uncertainty which kept investors away. Moreover, they were upset with Ms. Tata because she did not give a large dividend. Well, she had a dream – of starting Westside chain of stores. She pursued her dream. People who bought the stock, participated in that dream. Two years later, the stock was at Rs 700. I am not implying here that what happened in Trent will also happen in Piramal Healthcare. I am only drawing attention to the remarkable parallels between the two situations particularly in context of the nature of the uncertainty, and the market’s response to it. Professor, since there are fairly close parallels in the two situations of Trent and Piramal, what was your thought process with regards to your decision of the pricing aspect of selling Trent stock later? Surely it wasn’t possible to safely ride the rise in the stock price up to the Rs 700 level while looking at the situation prospectively. Did you wait till Ms. Tata’s retail plans fructified before you sold? Or was it some other event driven or price driven trigger? Taha, first, please don’t carry the parallels between Trent and Piramal situations too far! The only similarities I see between them are: (1) sale of “crown jewels” for cash; (2) decision to diversify; and (3) market’s disappointment with dividend/buyback policy and (2). In fact, there are many other such situations. Someone else in another comment has mentioned the case of Smartlink. Second, my blog post is less about what price the stock could be worth a few years from now and more about my opinion that the market is being irrational by valuing Piramal Healthcare below cash, despite the uncertainty. Third, the decision to sell should always be taken by comparing the investment with other alternatives available. One does not need to think about the price at which one would sell, when one is buying. The sell decision – or rather the price at which the sale must be made – need not be taken at the time of buying. It can be taken, years later, when the uncertainty has gone away and when one can more easily compare the current investment with other alternatives available at the time. The principle is buy into uncertainty and to sell when that uncertainty is gone, provided something better comes along. The exception to the principle of buying into uncertainty is that not all uncertain situations are worth buying into. For every Piramal Healthcare and Trent, there are many more of Gwalior Chemicals (now called GeeCee Ventures)/ Do check out what happened in that case. That was a great piece of learning Prof. Bakshi. Thank you so much! You made a very valid point in differentiating between the quality of holders of cash. I believe cash in the hands of aggressive egoistical managements has a negative value, while that in the hands of people like Mr. Piramal or a company like Infosys, has a neutral value till the time it is utilised in a profitable way. is that such a dividend would invite a tax liability for the company and thus a part of the current cash will go waste. A business like Infosys’s, which has consistently earned high operation returns (RoE), I believe, must not use its cash in any of the ways investors are haggling it to. At least not till the time it gives up on making any acquisition or its operational RoE falls down. What’s your view on the same? I know this is out of context of the Piramal chapter, but it still is in line with understanding that quality of management plays a very important role when it comes to handling the cash. Vishal, I agree with you. Cash is not as easy to value as it appears to be. It has a huge option value, particularly in a volatile market (volatility and option values go together). And, as you mentioned, the same amount of cash in the hands of the right kind of guy is worth a lot more than in the hands of the wrong kind of guy. Very frankly looks more of a PR pitch rather than a stock idea…..
Ajay, thanks for expressing your view here. Thanks for this one. In one of the comments, you captured my thinking on this. Essentially this seems very similar to Trent, higher cash on the books than mcap, capable managers and interesting domains. The only concern in comparing the two is that trent was a 60cr mcap company, this one is 9000cr and the upside could be limited in that manner. This also reminds me of your last investment analysis. What is your current thinking on Noida Toll Bridge? Some of the pricing power you assumed there did not work out so well. But even today it is an interesting buy. Any thoughts on that? Nirdhar, I have nothing to add to your thoughts on Noida Toll at this time. Let me first say thank you to you for sharing such amazing insights. I also participated in the Piramal buy back , but only from a perceptive of arbitrage and not yet from long term investment because i think , as you also mentioned that how markets reacts to such cases , one can surely get better entry points. But then i 100% agree to your complete analysis and to be honest i hadn’t studied it to the depth that you have done. So thank you so much for adding lot of value and making my life a bit easier. Secondly , for all those who think that there is lot of risk and uncertainty in this investment , please consider this…how many times will one get opportunity in one’s lifetime, to participate as a Private Equity player , with an entrepreneur who has successfully proved himself over long periods of time. Thirdly and most important , Sanjay it would be great to have your views on how should one go about figuring that whether a management does have a “Seamless Web of Deserved Trust” or not ? Amit, watch what they do. Do they end up with a lot of disputes with collaborators, customers, suppliers, employees, and regulators? There is a news today, that smartlink has sold its business to schindlers for 503 cr, converting at Rs 166 /- per share. The Share price is Rs 77/-. The press conference is not out yet so we wont know their intention about the cash but we can expect big dividend. So what’s the track record of Mr. Naik? Take a look at what he has factually done – post demerger operating performance (compared to the company from which it was demerged), dividend policy, consistent insider buying (promptly disclosed), and the sale at a fabulous price. While the market kept on valuing his company at a low price, he kept on expressing his disagreement by putting his money in the stock (and telling the market about it – just take a look at the number of disclosures of his purchases over the last one year). And then, when he is able to sell a part of the business at a huge premium to market price, the interviewers point fingers at him and ask him why he sold the business and not the company! In the interview, Mr. Naik comes across as someone who is not media-savy, is inarticulate, but he has delivered so far as operating performance is concerned. In contrast, take a look at the performance of the very articulate and media-savy promoter of the company for which the interviewers work…. As for your comment on SEBI, I don’t think it should be in the jurisdiction of SEBI to decide how the sale proceeds of a business should be used. That decision should be taken by the stockholders of the company. Thanks for the link to the paper on uU investing – really insightful. This is Sanjay here, a Cost Accountant. It was really a great piece of research on piramal healthcare. I have only one question, if you may allow. You have considered 10% discounting factor for arriving at PV of the future cash receivables. But these receivables are dollar denominated. USD 400 million per annum to be precise. Would it not be prudent to factor in currency appreciation which may take place over the next 4 years (period involved). In that case wont the PV of the cash receivable come down? I had in my calcultions factored in 20% discounting (10% p.a. for PV of future receivables and another 10% p.a. for currency appreciation every year.) This may sound too much. I would appreciate if you could throw some light on this currency aspect. Hedging is possible but can u hedge for the next 4 years and at what hedging cost ? For the record I held PH shares @ 419 and post buyback my effective cost of holding has come down to around Rs.358 per share. I intend to hold this stock for at least 10 years. Guide me on my vision for PH. You could also look at Mazda Ltd (BSE: 523792). Current Market cap Rs 38 cr. Debt is negligible at Rs 45 lakh. It recently sold its valves division to Circor for a consideration of Rs 22 crores. Rs 18 cr already received while the rest will be available after two years. Special dividend amounted to Rs 2.25 cr. Approximately Rs 10 cr in hand now. Proceeds from the sale of valves division will be reinvested in vaccum process equipments which are giving the company a higher margin, management has indicated. Minus cash, the current market cap is Rs 28 cr. Sales for the september and december quarters AFTER THE SALE OF VALVES DIVISION amounted to Rs 18 cr each with gross profit of Rs 3.34 cr and Rs 3.58 cr respectively during this period. Net profit amounted to Rs 1.98 and Rs 2.16 cr respectively. EPS Rs 4.64 and Rs 5.07 in the last two quarters giving the stock a P/E slightly higher than 4 on annualized basis. (CMP Rs 89). The management has also indicated that a new plant will become operational in April this year increasing capacity by 20 per cent. For the past ten years sales and profits have been growing steadily at 20 per cent or thereabouts. So good to read such a detailed analysis. I have been a regular reader here and have learnt a lot from your writings. Thanks for imparting your wisdom to us. Does piramal healthcare company has stake holding as the promoter holding in the piramal life sciences which involved in drug discovery? or the promoter holding of the Piramal life sciences entirely with ajay and swathi piramal? Piramal Healthcare owns a stake in Piramal Life. Hi Sajay Natekar here again. I am still waiting for your reply on my earlier post about current fluctuation involved. I used a pre-tax rate of 10% for a post tax receipt of funds. The tax on the receivable has already been paid. Please go to the company’s site and download and read the concall transcripts on currency fluctuations and hedging of currency risk. Another company where there’s lot of cash on the books is Hindustan composites. They sold their land in Mumbai for almost 500cr a year ago. Here the sale is not of a business but an asset that wasn’t earning much (may be). The share price is Rs.520 where as the cash value per share itself is around Rs.970 (485cr/50lakh). The company has negligible debt. The only problem I feel is that the company’s sales is 100cr with profit of around 10cr. They really have to show that they can deploy this cash effectively and grow the business. The should be able to demonstrate that they can operate at much larger scale. Has anyone taken a look at Mazda Ltd I had posted earlier in the comments section? Thank you for your incisive analysis on Piramal Healthcare. The sale was done on a slump basis resulting in large tax outgo. If Ajay Piramal so desired, he could have spun off the formulations business into a separate listed unit .He then could have sold his stake on the bourses resulting in tax free income for him.The other stakeholders could have tendered their shares in the open offer if they so desired. This would have resulted in tremendous value creation for the minority shareholders as they could choose to continue to have a stake in PirHealth formulations as well as other 3 biz units of PirHealth. Yet this was not followed.Very likely the reason was Abbott wanted an all-or-none deal and wanted to avoid regulatory hassles.Notice the premiums paid to delist by multinationals. 2.Track record of Ajay Piramal wrt to minority shareholders. If you look carefully the track record of Nicolas Piramal stock price, an investor holding these shares would have an annual benefit of around 17% (inclusive of dividends and PirLife).While this is quite good, it is not extraordinary in the Indian context. 3.Why is the market giving cash for free? Like you mentioned, Ajay Piramal will go out and acquire. Say he buys a company for 3x revenues with 517 Rs/cash i.e then PirHealth will have additional revenues of ~ 172 Rs/share. So you are getting this company for 12 times post acquisition earnings.This is in the mid-range of typical P/E valuations in the sector. You, my friend, may be suffering from Charlie Munger’s Inconsistency Avoidance Tendency and Influence from Mere Association Tendency. Just want to highlight a couple of things:Simone Tata sold Lakme in 1998.The stock price languished till 2002 around 60-70 levels.Only then it took off with the rest of the market.Noel Tata himself has mentioned in numerous interviews the difficulties he faced in starting the retail business.The success was totally uncertain. So probably the market was right in discounting the company. They sold business 9 times revenues. What is left on balance sheet is 5-6 times revenue. Now future value will depend on how much he spent to generate additional revenue. 1x, 2x 3x, or 5x of revenue. In your example @ 3x revenue .. he spends 517Rs and get value of 312Rs ( 26 Rs(EPS) x 12 P/E ). Unless there is possibility of turn around the business and generating higher value in future this kind of purchase does not make sense. Additional Revenue 344/- ( 517/1.5) -> PAT margin of 15% -> 51 EPS x 12 EPS = 612/- in per stock value. Additional Revenue 517/- -> PAT margin of 15% -> 77 EPS x 12 EPS = 924/- in per stock value. That would mean additional EPS of 114/- and with 20 P/E it would means 2280/- in per stock value. But now question is can he deploy 15k Cr rs (10k equity and 5k debt) to generate 22% return on net worth? How much time it will take 5 yr, 7 yr or 10 year? About this specific post – to me the question is – will he be able to buy assets at depressed/lower prices. If we will, there is a good probability of seeing above normal returns. Otherwise, unlikely! Couple of questions, if you may … I am not sure if he is expecting things to go down from here. Did you get any sense of that from the interview? Do you think he is trying to time the market? What is your take on Piramal’s decision to invest in infra funding space? Don’t you think if Piramal Healthcare becomes a holding company, the market will price it at a discount which would nullify the advantage of excess cash in hand? My take is that Mr. Piramal will do something intelligent in the space given: (1) he has cash; (2) banks are reluctant to finance these (real estate) and infrastructure projects; and (3) there is a lot of distress and therefore lots of opportunities for a value player sitting on cash. As for the other question, we have to wait for an answer. What do you think are the implications of Piramal’s entry into the financial services sector? The sector has lower valuations when compared to the pharma sector. Also, Ajay Piramal is around 57 years old, so how much longer do you think he will run this company? Will his daughter match up? The cat is out of the bag now. We know now what AP plans to do with all the money. Now as investors, we can do very little but to wait and see how it unfolds over the next few years. Banks are not lending money to real estate projects. Many of these projects are stalled because of inability to raise capital and promoters are offering very high rates of interest on borrowed funds. Ajay Piramal has the cash and the ability to take advantage of this situation. Its just what Warren Buffett did in the credit crunch of 2008-09. I won’t be surprised if the NBFCs lend money akin to what Graham called, “Well Protected Issues with Profit Possibilities” (See that chapter in “Security Analysis”) wherein one acquires a minimum interest return on debt backed by adequate collateral, but in addition one also acquires an upside. For those of you who are interested, go and study the deal structure of the Signature Island Project of Sunteck Realty from the perspective of the Piramal Group to understand what I just wrote. I have written earlier that this is not a stock for short-term market participants. This is a stock which you should buy and hold and not look at the stock price for the next 5 years. Sir, wanted to ask how much of one’s money should be alloted to this? And if stock falls more (like in present case), should 1 buy more or should just watch? Also if you could please post the link to that deal structure of Signature Island, it would be great. Couldn’t find much by googling except a 20:80 ratio for piramal. Depends on your conviction, and alternative uses of the money. i will post a blog post on the deal structure of Signature Island separately in due course. Thanks. Thanks a lot Mr Bakshi for your excellent article on Piramal Helth Care. Now as a value investor and after the proposed demerger of Piramal Life’s NCE Unit with Piramal Helth, I think there is a arbitrage opportunity and it makes seance to buy Piramal Life and sell Piramal Helth. So the interesting part is that if I buy Piramal Life I am paying the same price that of Piramal Helth but I am getting shares of Piramal Life,(as khoka) free of cost which may fetch some value in future. Sir I will be glade if you share your views on the same. Khoka? I did not understand this. Sorry …….. I mean to say ( Khoka) packaging material which comes free when you buy something and which can fetch some value. In this case Piramal Life Science which comes free ( Provided demerger is through) and after demerger Piramal Life Sce. will still remain listed on stock mkt. Have found you recently and think that you’re doing really good stuff. Nice piece on Piramal. I did struggle a bit with trying to assess the risk of the the three remaining units (loss-making as of now, I believe) and Piramal Life being demerged into Health, but the cash on the books and Ajay Piramal together seem to trump all of that. The price is even more attractive today than when you posted. It might even be possible for low volume buyers to get in on slightly better terms through Life at ~ Rs. 86/share (x4) versus Rs. 367/ share for Health, assuming the demerger goes through. What is your take on the Vodafone-Essar stake purchase? a) the amount of money invested is huge. It would be very difficult for the company to invest all the money in one go or short span of time. Even the conf call suggests that the money will be invested over the next 5 year. this means that the total money will put to use in lets say 4-5 years and half of the money can be put to use in lets say 2.5-3 years. After that it may take time for that money to provide returns which may vary but would still be 3-4 years to start generating returns. This is because normally capital is committed first and then returns generate over a period of time. c) they are entering into new businesses = Financial services and real estate funding etc. though the capital commitment wrt existing cash horde are less than 25%, even this money will take reasonably long time to generate return – Establishing the company, getting right talent, starting operations and then stabilizing the same may take time. 2. I wanted to understand whether the management bandwidth currently available would prove to be an issue in handling multiple businesses (including new ones) and deploying large amounts of capital. There is no debating the fact that Mr. Piramal is a very savvy deal maker but handling all the new things may prove to be a challenge to him also. Would look forward to your response, if possible for you. do you think that Piramal healthcare is heading towards being Berkshire Hathaway of the Indian markets? Mr Piramal’s moves and cash kitty seems to be indicating some such development. Have you noticed that prior to the demerger of piramal life sciences and PHL the stock for piramal life tanked 92%. What does one make of it? Is is because of the record date is set as 26th dec and if one buys the stock a couple of days prior to it you will not make it to the list of registered shareholders. i have a hunch that is the case but then if it was so why is SEBI allowing people to sell as the guy who is buying will lose money (unethically one might say too). 1. What remains in Piramal Life? Answer: One small operating business which, if I remember correctly, has an annual turnover of just Rs 4 cr. 2. Why was this business not merged into Piramal Health? Answer: The operating business which remains in Piramal Life cannot be merged into Piramal Health because of non-compete agreement between Abbott and Piramal Health. If this operating business was transferred, it would have been a breach of contract between Piramal Health and Abbott. As far as I know, there is no other reason than this one, for allowing such a tiny company to remain listed in a group having a multi-billion dollar size. 3. At Rs 10.40 per share, Piramal Life’s shares are valuing the remaining operating business having an annual turnover of Rs 4 cr, for Rs 26 cr. Why? Answer: Ask Mr. Market! On one hand Piramal Health shares sell below cash. 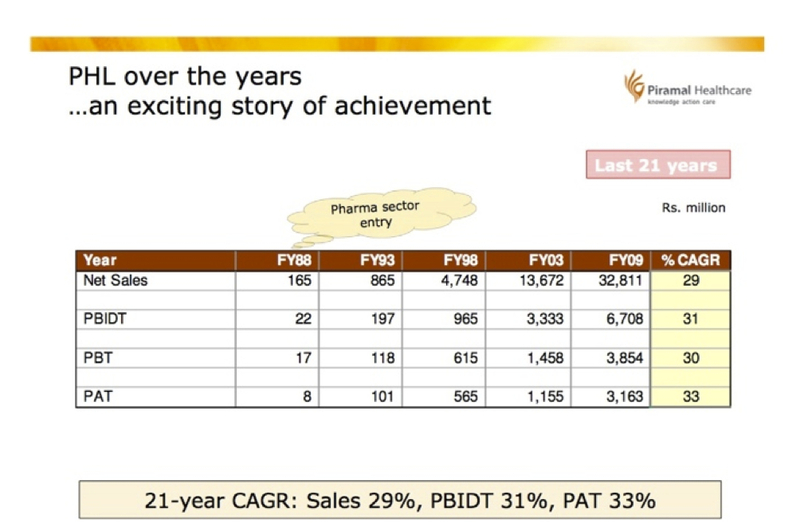 On the other hand, those of Piramal Life sell at almost 7 times revenues. His first acquisition was Gujarat Glass in 1984, not Nicholas Laboratories. Ajay Piramal took over in 1988, so Gujarat Glass acquisition was not done by him, as far as I know. He did merge it into his flagship company in 1991 and spun if off in 2004.
it is longtime since ispat and piramal that we have not seen any new discussion covering interesting stock market ideas!!! FundooProfessor It’s a pleasure to meet you,I’m a value investor and just came by chance here,I never invested in India cause I don’t understand the market well enough but I may look further into Piramal. This reminds me of an investment I made recently in Valeant pharmaceutical,in both cases we have a manager who understands well the pharma business and willing to deploy capital in undervalued acquisition. The main difference is that Mr.Pearson doesn’t like to spend in R&D,he prefers to buy small businesses that big companies dislike or don’t look at,the value is created when these “peanuts” are inserted into Valeant franchise and distribution network,the track record is astonishing revenues for the acquired companies increase many times. Now,the real value creating machine is Valeant’s franchise and network and that’s the core asset investors are getting,since you know well this company my question is can we say the same thing of Piramal?Is there a powerful catalyst to realize value when they fit new businesses into Piramal’s network? I think that the question here for value investors is if Piramal wants to become a strong pharma business where synergies and economies of scale are achieved(like valeant) or an holding company. very very sincere thanks for the post. chapter 8 (and new commentary on it) emphasize on not over paying. and have shown through graphs ( as charlie said … they showing our(mine) numerical disability) that investment returns can be significantly changed by the price we pay for them. 2. what would be the cash positions as of now and holdings in subsidiaries like piramal glass and other group companies ….. as the company in most resent annunsment have finally resolved to change name to piramal enterprise. what do you think that management will do to bring publicly traded companies under Enterprise logo ( just in case you are going to annual meeting on 19 or 20 July … would you please ask this question), what is the policy of management on that. I wanted to know how you calculated the incremental value? like Rupee 1 retained became Rs 5.80 in incremental market value..how do we calculate this 5.8? or 5.5, 5.1, 4.7? Hope I made myself clear. May be am missing very basic stuff here. It’s since 3 years you shared your views with us about Ajay Piramal. It would be really helpful if it is possible for you to do a review now as to how things stand today. You are our Ben Graham. What you write is not only educative but helps our investment journey in terms of picking up good companies as well. I’m following you for last 3 years and immensely benefited from your wisdom. I’m confident there would be at least hundreds of others like me. I would like to convey my heartfelt gratitude for what you’ve been doing. Request you to continue this.